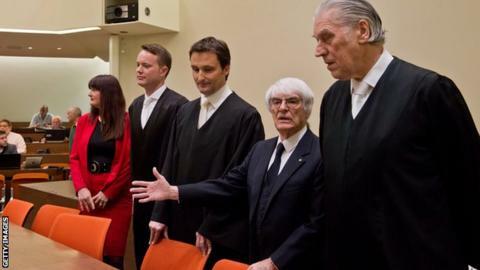 Formula 1 boss Bernie Ecclestone made his first appearance in a Munich court on Thursday, to answer charges of bribery. The 83-year-old Englishman is accused of giving a £27.5m ($45m, 33m euros) bribe to a German banker to secure the sale of a stake in the F1 business for a company he favoured. Here, we look at some of the main issues from his first day in court. What was Ecclestone's mood beforehand? The F1 chief arrived for court with his lawyer, Sven Thomas, and was forced to walk into Room 101 of the Munich District Courthouse in front of a bank of television cameras and reporters. As he prepared to enter the building, he was asked if he was feeling confident about his prospects, to which he cryptically replied: "I am confident the sun is shining." With F1's board of directors prepared to sack him if he is found guilty of any criminal wrongdoing, the leadership of the sport is currently in doubt. What did we learn in court? The prosecution laid out their case in depth. They believe the bribe was made to ensure the sale of shares in the sport, which Gerhard Gribkowsky controlled on behalf of a German state-owned bank, were transferred to a company of Ecclestone's choice. This, they say, is an indication of his determination to claw back control. Lawyers for Ecclestone argued the money was not a bribe, and that a payment was only made to stop Gribkowsky carrying out a costly threat to report him to tax authorities in the United Kingdom. "I saw my life's work under threat," said Ecclestone in a statement read out to the court. That statement, which began with a description of Ecclestone's childhood in wartime London and included a tale about how he was nearly killed by German bombs during two separate air-raids, eventually focused on his denial of the charges against him. It also detailed how he had felt under pressure from Gribkowsky. "People may ask how can it be that Bernie Ecclestone can be put under pressure," read the statement. "Yes, it's possible if you know where to apply the pressure - and Gerhard Gribkowsky knew how to." When is Ecclestone due to give evidence? The trial is due to resume on 2 May, but the first witnesses will not be called until 9 May. Ecclestone is one of 39 people due to give evidence, but the exact date when he will address the court is still unknown. Had his mood changed by the time he left? He appeared briefly during the lunch break but chose another exit to avoid the media when court proceedings concluded for the day. Hardly surprising given that it threatens to be a long summer for Ecclestone, whose personal future and leadership of F1 are at stake.